Just a week ago I was fully immersed in teaching at St. Peter’s Abbey. 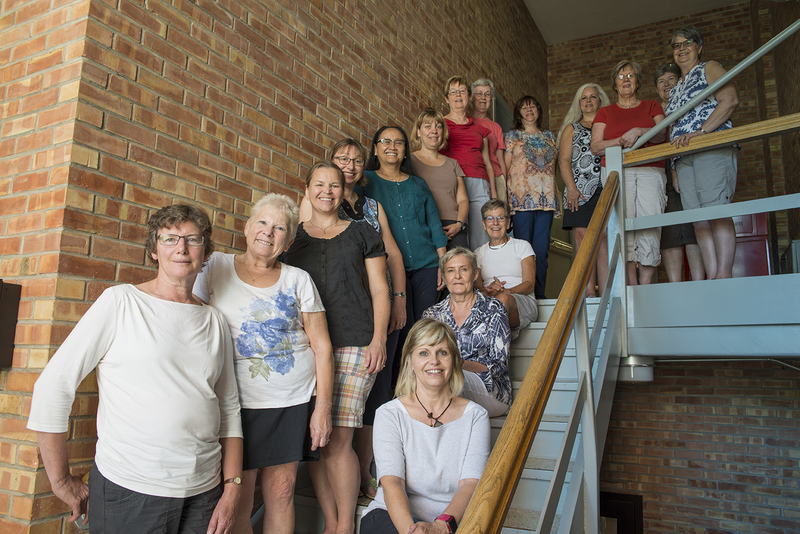 What a wonderful group of ladies gathered for the second week of Art Quilt Campus. Here is a group photo we posed for on Friday morning. But like all great things – they come to an end and life goes on. I spent the week catching up with that life. My computer is healthy again but it meant that I was playing catch up with correspondence till today. I am now actively packing for my trip to Boston and New Hampshire for World Quilt Show – New England which begins a week from today. My next post will be from south of the border. The friend I am visiting shared that among other sights I will get to visit the Plymouth Rock… American history at its best! I have never been to the eastern US and am looking forward to a new experience. I checked the weather and am glad to see that I can pack light… the projected temperatures on the weather network app are reflective of a summer heat wave! 07 Aug	This entry was published on August 7, 2014 at 5:07 pm. It’s filed under Art Quilt Campus, Creativity Update, History, Journaling, Quilt Show and tagged Art Quilt Campus, Boston, packing for World Quilt Festival, Plymouth Rock. Bookmark the permalink. Follow any comments here with the RSS feed for this post. Thanks, Donna! Hope you are enjoying your summer at the lake!